For more than 25 years since its US debut at the Metropolitan Museum of Art, the French early-music group Les Arts Florissants has been visiting the New York area at least once every season. Since its life-changing Atys first arrived in 1989 at the Brooklyn Academy of Music (where the Lully returned one last time in 2011), LAF has presented works there which have challenged many perceptions about 17th and 18th century opera. So acolytes of William Christie and his remarkable musicians and singers and—one might hope—scads of new fans are eagerly anticipating the four-performance run of Charpentier’s David et Jonathas opening on April 17 at BAM’s Howard Gilman Opera House. Marc-Antoine Charpentier—no, not the one who wrote “Depuis le jour” (that’s Gustave)—was born in Paris in 1643 and lived and composed there his entire life except for a life-changing trip to Italy in the late 1660s. While in Rome, he studied with the great Giacomo Carissimi whose influence transformed his life—for both good and ill. Carissimi wrote almost exclusively sacred music and is credited by many with creating the oratorio. His most famous work, Historia di Jephte reveals the deeply felt, yet sensuous writing that would also become a hallmark of Charpentier’s. The musical Paris that he returned to was dominated by Jean-Baptiste Lully, who eventually bought a patent giving him complete control over which operas could be performed in France. Cut off from that option and perhaps because of his training under Carissimi, Charpentier turned to the church and his oeuvre is dominated by sacred compositions, his most performed work his Te Deum. While many appear to prefer the setting of the Leçons de Ténèbres for Holy Week by his near-contemporary François Couperin, Charpentier’s, including the extremely beautiful set recorded by Gérard Lesne, should be more regularly heard instead. As Lully was busy creating French opera (which was late getting started compared to its Italian counterpart), he ceased writing incidental music for the plays of Molière with whom he had profitably collaborated for more than a decade. Charpentier jumped in to fill the void and their collaboration La Malade Imaginaire premiered in 1673, presenting him with perhaps his greatest public success during his lifetime. Les Arts Florissants took part in a lavish revival of the complete Molière-Charpentier work in the early 90s which was televised and its score recording . Denied the royal patronage sought by all composers, he persevered with his church music while also writing numerous delightful small-scale dramatic works—pastorales and divertissements—often for his principal patron Mlle de Guise—including the exquisite La descente d’Orphée aux enfers in which the composer who had a fine haute-contre (high tenor) voice sang the leading role. Since Lully’s patent blocked his access to the Académie Royale and opera, Charpentier was given the opportunity to explore the genre at the Jesuitical Collège Louis-le-Grand noted for its elaborate presentations of spoken sacred Latin tragedies interwoven with tragédies lyriques. 1687’s Celse martyr was Charpentier’s first large dramatic work there, but unfortunately it has not survived; however, the next year brought David et Jonathas set to a libretto by Père François Bretonneau and presented in between acts of Father Pierre Chamillart’s Saül. It would be more than 40 years until a similar Biblical opera would appear at the Académie Royale: Montéclair’s Jephté, a work beautifully recorded by Les Arts Florissants but now sadly out-of-print. Lully’s death in 1687 opened up the opportunity for Charpentier to finally compose his only secular tragédie lyrique—Médée—which premiered in 1693 when the composer was 50, the same age at which his great successor Jean-Philippe Rameau wrote his first opera. The setting of the story of the Greek sorceress proved to be the greatest French opera yet written, yet the rabid Lullists committed to the aesthetics and memory of their late master made sure that Charpentier’s work was not a success. The crushing irony throughout his career was that his work was frequently denounced as “too Italian” or “not French enough” by the supporters of Lully, who, of course was born Giovanni Battista Lulli in Florence but yet strove (and succeeded) to become more French than any native Frenchman. After his death at 60, Charpentier’s music quickly fell into obscurity until Saint-Saëns resurrected it in the 1890s and trashed the composer and recomposed his score for La Malade Imaginaire. Only after the Second World War did a real effort begin to reconsider his music, an effort spearheaded primarily by North Americans, including two men—one born in Detroit, the other in Buffalo—most responsible for Charpentier’s renaissance. H. Wiley Hitchcock, best known for co-editing the New Grove Dictionary of American Music, wrote extensively about Charpentier publishing a catalogue raisonné wherein he compiled the composer’s surviving works and established a number system (à la Köchel for Mozart) now considered definitive. Simultaneously harpsichordist William Christie moved to France and in 1979 founded Les Arts Florissants, named after Charpentier’s idylle en musiquer. Since then, Christie has been tireless in performing and recording the composer’s works, finally establishing him as the great figure between Lully and Rameau, yet one of whom no portrait nor image has survived. As Les Arts Florissants has raised the bar for historical performance for this music, it has also embraced working with many of the most challenging directors for its operatic presentations seen at BAM. After his Atys, Jean-Marie Villégier’s highly stylized yet dramatically searing productions of Rameau’s Hippolyte et Aricie and Charpentier’s Médée , both starred the incandescent Lorraine Hunt Lieberson. Robert Carsen’s Orlando (Handel) and Les Boréades (Rameau), as well as Luc Bondy’s Hercules (Handel) lit up by the blazing Dejanira of Joyce DiDonato and Adrian Noble’s Il Ritorno d’Ulisse in Patria (Monteverdi) have all demonstrated the effectiveness of provocative approaches. David et Jonathas will likely fascinate as well, as it will provide US audiences with their first look at the work of noted director Andreas Homoki. As its Intendant from 2002-2011, Homoki established Berlin’s Komische Oper as the world’s leading opera house for cutting-edge Regietheater. He has now taken over the Zurich Opera where his new production of Shostakovich’s Lady Macbeth of Mtsensk opened just last week. Surprisingly this production will neither be the Charpentier work’s NYC premiere nor even its first production at BAM. In 2004 Emmanuelle Haïm made her US conducting debut at Lincoln Center with a concert performance featuring the Orchestra of the Age of Enlightenment and dominated by Laurent Naouri’s tormented Saul. A group called American Opera Theatre (an organization I’m afraid I’d never heard of before or since) presented a staging at BAM in 2008 to positive reviews, but I missed it unfortunately. Like Handel’s towering oratorio Saul, Charpentier’s Biblical is based on the book of Samuel and depicts the tender friendship of David (haute-contre) and Jonathan (soprano) and the enraged jealousy of King Saul (bass) over both that relationship and David’s growing popularity with the people. A prologue, followed by five acts (a little over two hours of music), opens with Saul’s visit to the Witch of Endor (La Pythonisse) to summon the ghost of Samuel who foresees the death of Saul and his son Jonathan. Each of the first four acts concentrates on one character’s state of mind: first, David, then Joabel (the war-monger), Saul and finally Jonathas. The fifth act brings the deaths of both Jonathas and Saul amid the celebration by the people of David’s bittersweet victory. For those who have never experienced French grand opera from the rise of Lully to the death of Rameau, it’s a world completely unlike opera seria. There are no “star” singers indulging in extravagant da capo arias; these tragédies en musiques feature colorful choruses (which are never a part of Italian opera), extensive dance suites (although few in David et Jonathas) and no secco recitatives but a more organic form of musical discourse where conversing characters can shift from flowing recitative into a more aria-like structure and then back again into recitative. This clearly evolves from a commitment to the importance of declaiming the language making sure the complex, poetic libretti are understood. The sumptuous orchestral writing exploits a large orchestra of nearly 40 on the LAF recording of the Charpentier, along with a chorus of 30. That 1988 recording of David et Jonathas by Les Arts Florissants is self-recommending, surely one of its best, with Gérard Lesne and Monique Zanetti wonderfully moving in the title roles. The BAM performances will be particularly noteworthy for the first NYC appearances of the inimitable French countertenor Dominique Visse since 1990 when I heard him sing a ferocious Sorceress in Purcell’s Dido and Aeneas with LAF at Alice Tully Hall. He will appear as La Pythonisse, a role he also sang on that LAF recording 25 years earlier. Apparently Visse once sang in an opera in Houston (although I can’t find what it was) so this will be only his second time on stage in the US. Having seen him in Europe and on video, he remains a unique stage animal and an arresting performer. A delightful adjunct to the four Charpentier performances will be a concert by the sixth edition of Le Jardin des Voix, Les Arts Florissants’s academy for young singers. Begun in 2002, this biennial program provides intensive coaching and instruction for artists interested in the 17th and 18th century repertoire. Originally co-directed by Christie and Kenneth Weiss, an American harpsichordist and conductor who has also spent most of his career in France, Christie now shares his duties with Sophie Daneman and Paul Agnew, two British singers with a long association with Les Arts Florissants. The academy’s end-product is a concert presentation which tours widely, and all but the first group has performed in New York. While the earlier evenings contained of a grab bag of composers from different countries, last year’s focused on the music of Lully and his contemporaries, as this year’s will do the same for Rameau. “Le Jardin de Monsieur Rameau” was created perhaps because there will be no academy in 2014—the Rameau year, a commemoration of the 250th anniversary of the composer’s death. 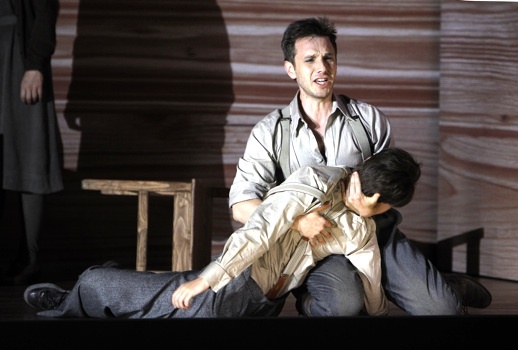 In its previous five editions, the Jardin has proven extremely successful at cultivating some of this repertoire most promising singers, particularly countertenors who have included Maarten Engeltjes, Xavier Sabata… and Christophe Dumaux, currently stealing each performance of the MET’ s new Giulio Cesare as Tolomeo. Another alumnae include Blandine Staskiewicz, who is about to appear with Sabata in a new production of Handel’s Alessandro in Athens, Tehila Nini-Goldstein, who is starring in a much anticipated revival of Myslive?ek’s L’Olimpiade, and Katharine Watson, whose Dafne in Handel’s Apollo e Dafne arrives at Zankel Hall this fall. Clearly she profited from the instruction that has molded many others. Sonya Yoncheva, who went on to win first prize in 2010’s Operalia, participated in the 2007 edition which was the subject of a fascinating in-depth documentary about the academy. New Yorkers will get a chance to judge Yoncheva’s star quality (and baroque cred) when she appears in Handel’s Aci, Galatea e Polifemo at Lincoln Center in October. The Jardin concert at BAM on April 19 features music by Dauvergne, Grandval, Montéclair, Campra and Gluck (selections from L’ivrogne corrigé, which was recently staged in New York), as well as Rameau. The widely varied program looks fascinating and any opportunity all to hear performed live Rameau’s supremely beautiful quartet “Tendre amour” should be embraced. This year’s laureates include Daniela Skorka (Israel), Emilie Renard (UK), Benedetta Mazzucato (Italy), Victor Sicard (France), Cyril Costanzo (France), and Zachary Wilder (US). A tenor, Wilder is only the third American chosen out of the 44 singers who have so far participated in the six editions. I wondered what this experience has been like and he was extraordinarily generous in answering a few questions for Parterre. DeCaff: You already have a promising career in the US and Europe, so what prompted you to enter the competition for the 2013 edition of Le Jardin des Voix with Les Arts Florissants, and what were your feelings when you learned you had been accepted? ZW: Les Arts Florissants and William Christie are towering figures in the baroque repertoire, and I’ve been studying their recordings since I was in undergrad at Eastman School of Music. When I saw the audition posting, I was actually working at La Fenice with Pascal Charbonneau at the time. He’s a former Jardin grad, and he explained to me that it’s an important opportunity to work with some of the best in the industry, spend time refining style, sing in some very important halls, and garner great exposure. Funny enough, Pascal and the show’s continuo team ended up sneaking into Venice’s Teatro Malibran with me to help record some tracks for my audition tape on his smartphone. I did my audition in NYC during the Green Mountain Vespers in January 2012 and was told by Christie I was on-board. I remember dancing and wiggling my way down Amsterdam from Lincoln Center to 33rd Street to board the bus to Boston. DeCaff: Are you now (or have you ever been) an haute-contre? ZW: I have definitely been accused of being one, but I plead not guilty! I look at haute-contre not as a voice type, but as a repertoire with a very specific set of (challenging) requirements: high tessitura, nuance, style. At the end of the day, I like to sing a wide variety of other repertoire as well, so I tend to stick with tenor! DeCaff: What were the rehearsal/coaching/preparation sessions like and what did you find particularly helpful or surprising? ZW: We began our coachings with Sophie Daneman, Paul Agnew, and Anne Pichard who really provided very practical working knowledge of the repertoire; especially regarding language, rhetoric, and dealing with the peculiar problems that these works present (i.e. French recit $&#!). When Christie arrived, he worked with us to refine and exact the sound and style. What is particularly remarkable is his ability to offer one seemingly small solution that ends up pulling an entire aria into place. He was also able to provide a lot of insight into the context of this repertoire; for example, we are singing a lot of excerpts from Rameau’s pastorales heroïques which are set in an idyllic sort of poetic Garden of Eden/Arcadia. Christie proffered that this music is intrinsically melancholic as the libretti deal with a wildly unattainable utopia. That popped a lot into place for me, and additionally works like Poussin’s Et in Arcadia ego and Handel’s Acis and Galatea really gained a whole new perspective. DeCaff: By the time that you reach NYC for the final concert, you will have done seven concerts already. How has performing this music been, and how has the experience of working so closely with your other five colleagues been during this exhaustive (and perhaps exhausting) experience? ZW: Well, from the get-go, it was clear that this was not only a group of talented colleagues, but also a very levelheaded one. It provided for a safe atmosphere to try out a lot of new ideas and the result is a real sense of ease with one another on stage. It’s not often that you get to spend this luxurious amount of time with a repertoire, and we have been afforded the opportunity to get our sea legs in other cities before we hit Paris and NYC. There has also been an unreasonable amount of chocolate consumed on this tour by the cast for some reason. DeCaff: What can you say to an American audience coming to your April 19 concert at BAM about what they might expect, particularly about the music that very few may be familiar with? ZW: I would venture to say that this concert is a very good survey of the musical landscape that leads up to and surrounded Rameau (including Rameau himself). I think the most important thing to know about this music is that it places text and dance at the forefront. Expect rich harmonies, luxurious orchestrations, swinging rhythms, and a wide palette of expressive ornaments—all of which stem from the language and aid in delivering the poetry.